Beauty Icon Stacey Schieffelin to Debut New Line on Sunday. Turn your TV's to HSN this Sunday, as beauty expert (and former Ford model) Stacey Schieffelin will be debuting a new line up of products in her ybf Beauty collection. If you did not know, Stacey created ybf Beauty - Your Best Friend, exclusively with the Home Shopping Network. For a very long time, Stacey had a line of products called Models Prefer that I really liked. I am not sure what happened to that line with QVC, I am sure it was just a business deal, because the products were very popular. As I trusted Stacey and her products before, I cannot wait to try out some of these new beauties. The new ybf Beauty products are going to grow up a bit this time, as Stacey takes her soft PINK into a new shade of beauty that can be worn on EVERY woman. This is going to be called Unstoppable Red. I guess it is time to go from demure to dazzling with this new fabulous red collection, and now is the perfect time as the seasons soon change. The new collection will kick off with a Red Carpet Today’s Special on Sunday, which includes many of ybf’s core products like fan favorite Neutralizing Yellow Powder and Stacey’s famous Universal Taupe Eyebrow Pencil (which was a staple in my makeup bag from Models Prefer!). I'll be watching to see what the Today's Special is and cannot wait to meet the new products. 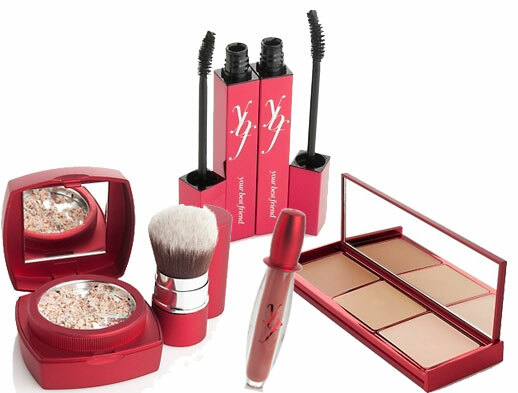 Again, ybf Beauty will have the Today's Special this Sunday, August 15, 2010 only on Home Shopping Network and HSN.com. MAC On the Scene Cremesheen Glass.